Recently, someone commented on one of my geomancy-related pages asking about the directions associated with the geomantic figures. I’m…actually surprised I don’t have a post written about that, and it’s a good topic, so I figured I’d oblige and discuss that briefly. Like with anything, there are more than one set of correspondences that can be used, depending on what source you’re working from or what techniques you’re using, but it’s not like that’s anything new to someone who’s familiar with the corpus of knowledge for geomancy. Where might the lost thing lie or be hidden? The first is given to the querent, the tenth to the thing, and the fourth to the place under consideration. In addition, another way to know the place of the hidden thing: consider by the fourth figure in which part of the world the thing may be in. That area is divided from the East to the West [and] from the South to the North, for there the thing will be found, which the fourth figure will demonstrate. And if that area is too large for the sudden discovery of the hidden thing, it is necessary to again divide that part into four other parts, and so often it is known until what time the place may be sufficiently small for the quick discovery of the hidden thing, and the fourth figure will always be the demonstrator of the place in this manner. When, therefore, you find the fourth, where the thing may be found, you will make a new judgment, and similarly judge by the fourth house as before. Then, the indicated area is again divided into four equal parts; this method is repeated until the place is reduced into a small or confined space. While Fludd’s and my elemental associations for the figures differ slightly, the idea is the same: associate the elements with the directions, and use the elemental rulers of the geomancy figures as a basis for knowing their directions. Another thing to note is his manner of associating the elements with the directions; I haven’t seen this specific manner of associating directions with the elements before, but I have written about different ways to correspond the elements with the directions and how it works for someone internally to their own system. I prefer the Agrippa-style correspondences, based on the celestial directions of the four cardinal signs of the Zodiac, but your mileage and preferences may vary. Use the system most appropriate to you. … Near the location where the item is thought to be, the geomancer is told to make a tableau and then to count how many waters are in it (i.e. to count the figures having a single dot in the third rank and to multiply this number by three). If less than eight there is nothing there; otherwise, the geomancer should proceed to make a new tableau, after marking the directions of the compass on the ground. He then counts all the elements in the tableau, multiplying the number of single dots in each rank by the value of the rank [ed. note: 1 for fire, 2 for air, 3 for water, 4 for earth]. the sum is then divided by 128, the remainder divided by 16, that remainder divided by 9, and finally that remainder divided by 4. If one is left the direction is easy; if two, west; if three, north; and if four south. The geomancer then faces that direction and draws a square on the ground and follows the same procedure to produce a new tableau, and the numerical process is repeated until one, two, there, or four is left. Then the geomancer looks a the Mother in the tableau which corresponds to this remainder and locates that figure in the square diagram in the manual … The corresponding position on the square which he has drawn on the ground in front of him determines where the object is. If it is buried, then the depth can be determined by knowing that the element of fire is assigned the depth of a finger, air the depth of the breadth of a hand, water the length of a cubit, and earth the length of a human body. The geomancer then looks at the figure of the Mother which was found to be the indicator, counts the ranks containing only one dot, and adds up the corresponding lengths. Then, using a certain ordering of the figures known as the “taskīn of the letters”, he finds the figure that occupies the same position in the taskīn that the Mother occupied in the tableau. He counts the ranks of that figure which contain a single dot and adds the corresponding lengths. Finally, he finds the sum of the number obtained from the Mother and the number found from the figure in the taskīn. This is the depth at which the object is located. Savage-Smith and Smith go on at length about this system of lunar mansions and how they relate to rising and setting along, but that’s outside the scope of the current post. That said, I don’t know where JMG got this set of associations from (or I forgot). At first glance, they seem tied to the planetary-zodiacal correspondence and linking the signs of the Zodiac to the houses, such that Puella is considered associated with Libra due to its association with Venus, and Libra is the seventh sign, then Puella should be given to the seventh house. Though JMG uses this planetary-zodiacal correspondence, I prefer the one given by Gerard of Cremona; again, your mileage and methods may vary. Beyond that, though, I’m not certain where this specific geomantic association came from, and it only seems very loosely tied to the planetary-zodiacal correspondences of the figures. Hope that helps! Personally, I prefer to use the simple elemental rulerships of the figures as the key to corresponding directions with them, at least where geomancy and its symbols are considered primary. For instance, if I’m doing a ritual that uses the geomantic figures as the primary symbols I’m working with, I’ll face the direction associated with that figure’s elemental ruler; if I’m doing a geomantic reading, I’ll use that same direction in location/direction-related queries. If, however, I’m performing a ritual where the planets or zodiac signs are primary, I’ll face the direction of that celestial thing and use the geomantic figures (if I use them at all) facing that direction. Context, I suppose, is everything, but for the purposes of divination and geomantic ritual, simpler is better. Recently, I described my method of applying PGM IV.1596, a prayer used for a consecration under the twelve faces of Helios, in a ritual format, but there’s a lot of stuff in there that isn’t in the PGM because…well, it’s not in the PGM. All that we have is the prayer, so I took some liberties and frameworks of my own and structured a ritual around it. As part of that, I incorporated four barbarous words of power: ΕΡΒΗΘ, ΛΕΡΘΕΞΑΝΑΞ, ΑΒΛΑΝΑΘΑΝΑΛΒΑ, and ΣΕΣΕΓΓΕΝΒΑΡΦΑΡΑΓΓΗΣ. I only briefly mentioned where they were from, and only really discussed them once before on my blog as something relating to the directions, but I think it’s time for me to talk a bit more about them. The Sun, again, changes his form based on his position in the sky, only instead of it being hour by hour as in PGM IV.1596, here he changes based on what quarter of the sky he’s in. The northern quarter has the name ΣΕΣΕΓΓΕΝΒΑΡΦΑΡΑΓΓΗΣ with the form of an infant seated upon a lotus. The southern quarter has the name ΛΕΡΘΕΞΑΝΑΞ (part of the whole Aberamen formula) with the form of the sacred solar falcon sending out heat and fire. The western quarter has no name here, but the form of a crocodile with the tail of a snake sending out coldness and water. The eastern quarter has a long name starting with ΕΡΒΗΘ, with the form of a winged dragon with a “diadem of air”, or of clouds. Despite what I normally think about him and his work, Stephen Flowers in his Hermetic Magic occasionally hits on a few good thing. He references this part of the PGM in the construction of his Hermetic ritual circle and preliminary invocation; after he calls the sevenths with the seven vowels in the Heptagram ritual, he then uses the four names ΕΡΒΗΘ, ΛΕΡΘΕΞΑΝΑΞ, ΑΒΛΑΝΑΘΑΝΑΛΒΑ, and ΣΕΣΕΓΓΕΝΒΑΡΦΑΡΑΓΓΗΣ as well as the four forms given to the four directions as stated before. While this section of the PGM does not list ΑΒΛΑΝΑΘΑΝΑΛΒΑ as one of the names, given its presence throughout the rest of the PGM, I think it could be a safe attribution to make. However, Flowers isn’t the only one to use barbarous words of power for the directions. Michael Cecchetelli in his Book of ABRASAX uses a similar arrangement in his ritual of “Calling of the Sevenths to Induce Equilibrium”. In it, he uses the names ABLANATHANALBA, AKRAMMACHAMARI, DAMDAMENNEOS, and SESENKEBARPHAGES for the south, north, west, and east (well, technically, to the right, left, rear, and front of the magus, respectively, while facing the East). However, he doesn’t say where these words come from nor whence their directional correspondences, and neither does he list any visualization or imagery for the names; he says the ritual is found in “PGM 824”, though I’m pretty sure he means to reference lines 824 through 840 of PGM XIII.734-1077, a long section entitled The Tenth Hidden Book of Moses that includes far more than just the recitation of the seven vowels of the Heptagram and, in fact, includes a far more complex calling of the directions, as well. However, this section doesn’t list any words of power for the directions specifically, and Fr. MC’s spelling of the names is a little odd compared to what we’d normally find (ΔΑΜΝΑΜΕΝΕΥΣ instead of ΔΑΜΔΑΜΕΝΝΕΟΣ, ΣΕΣΕΓΓΕΝΒΑΡΦΑΡΑΓΓΗΣ instead of ΣΕΣΕΓΚΕΒΑΡΦΑΓΗΣ). It’s my own innovation to include the heights and the depths to this directional framework, and the two names have responded more-or-less well in practice, though they do feel a bit detached from the others. This makes sense; in the context from which the four names for the cardinal directions come, they reference the forms of the Sun in his path across the skies, while the heights and the depths don’t really take part in the path of the Sun. Instead, they form more of a backdrop, a general rulership, or “host” to the Sun. ΑΚΡΑΜΜΑΧΑΜΑΡΕΙ has the form of an old man in pale grey or white silver, balding with head uncovered, looking downward, holding a ring of keys in his right hand and a staff as tall as he is in his left. ΔΑΜΝΑΜΕΝΕΥΣ has the form of a young woman dressed all in fiery red, head and hair covered in a red shawl, looking directly forward, holding a tall spear in her right hand a torch in her left. It’s important to note that these are personal revelations and are somewhat influenced by the planetary attributions of the heights and depths given in the Heptagram (heights with Saturn, depths with Mars), but were obtained from the names through reflection and meditation. It’s also striking that these forms are humane in nature, unlike the animal forms of most of the Sun’s forms with the exception of the face of ΣΕΣΕΓΓΕΝΒΑΡΦΑΡΑΓΓΗΣ in the north, where it’s a babe (primordial human) on a lotus (the growth of celestial seed and fertile earth). Now we have six names, but what about a seventh? We have names for the four cardinal directions, the heights, and the depths, but we’re lacking one to match the directions used in the Heptagram ritual, where that missing direction is the center. For this, I originally suggested to use the name of one’s HGA/genius/paredos/agathodaimon/whatever, but after some more meditation and communion with…something, I settled on the word ΜΑΛΠΑΡΤΑΛΧΩ, a word I use for empowering and directing the self itself. This is, again, a word I was “given” by one of the planetary angels, but I felt like it works well as a stabilization and centralization of the self in preliminary rituals. It’s like a generic “higher self” name, in my experience. So, to that end, my ritual (or mini-ritual component) for calling on the directions goes something like this. Start facing the east (or whatever quarter of the sky the Sun happens to be in), and calm and center the breath. ΙΩ ΕΡΒΗΘ, take thy place in the East! ΙΩ ΛΕΡΘΕΞΑΝΑΞ, take thy place in the South! ΙΩ ΑΒΛΑΝΑΘΑΝΑΛΒΑ, take thy place in the West! ΙΩ ΣΕΣΕΓΓΕΝΒΑΡΦΑΡΑΓΓΗΣ, take thy place in the North! Return to the original direction. For the next two guardians, stand with both feet together and look towards the direction, moving the right hand towards it and moving the left hand away; thus, raise the right hand and lower the left when saluting the heights, and vice versa for the depths. Again, visualize the guardian while saluting. ΙΩ ΑΚΡΑΜΜΑΧΑΜΑΡΕΙ, take thy place in the Heights! ΙΩ ΔΑΜΝΑΜΕΝΕΥΣ, take thy place in the Depths! For I am ΜΑΛΠΑΡΤΑΛΧΩ in the Center of All! If you wish, mentally intone the name of your HGA as you physically say the word ΜΑΛΠΑΡΤΑΛΧΩ. And that’s basically what I do when calling on the guardians of the directions, although I’m thinking of changing it up some. As I’ve mentioned before, the guardians of the heights and the depths don’t feel in the same current as those of the four directions; they do respond, just not with the same force or oomph as the other four. For a general preliminary invocation, I’m probably just going to drop the salutation of ΑΚΡΑΜΜΑΧΑΜΑΡΕΙ and ΔΑΜΝΑΜΕΝΕΥΣ, though I will keep the self-proclamation of ΜΑΛΠΑΡΤΑΛΧΩ as a preliminary centering act before other ritual work. Admittedly, it’s been not that easy for me to contact the four guardians, but when I have, they’ve indicated that they’re not strictly separate, just as the four points on a circle aren’t really separate but part of the same line. Instead, they told me that they’re definitely stations, managers, or “reflections” of the Sun at the four corners of the world. This is fascinating in retrospect, since I only really fully realized what this meant after reviewing PGM II.64 in light of the consecration of the twelve faces of Helios, which is a much more recent study. However, they do have separate powers and presences, and although they are best called together, one will usually predominate, the one that represents the quarter of the sky that the Sun is currently in. I’m a dunce for not recognizing this sooner or picking out the patterns, but this has led me to think of a new ritual dedicated just to the salutations of the four faces of the Sun in the two realms of the Heights and the Depths. It’s turned out a bit like Liber Resh, about which I’m unsure about how I feel, but it’s a good PGM-centric alternative to be used by those who don’t have a taste for Crowley’s rituals. Again, when I say “noon” or “midnight”, I mean astronomical noon/midnight, not necessarily clock noon/midnight, since things like summer time or DST may leave you an hour early or late to the appropriate station. At sunrise, hail the rising Sun in the East crossing the boundary from the Depths to the Heights. Face the rising Sun at the East, with the right foot forward and right hand raised in salutation, visualizing the form of the winged dragon-serpent with a crown of clouds taking reign over the East. ΙΩ ΕΡΒΗΘ, you who are Helios who rise now from the realm of ΔΑΜΝΑΜΕΝΕΥΣ into the realm of ΑΚΡΑΜΜΑΧΑΜΑΡΕΙ, take your place in the East as you come from the North, quelling all discord as you bring bright force to dark space! Extend both arms outward with the feet together. For I am ΜΑΛΠΑΡΤΑΛΧΩ standing before you, calling upon you who are ΕΡΒΗΘ! At noon, hail the bright Sun in the South at the zenith of the Heights. Face the noontime Sun at the South, with the right foot forward and right hand raised in salutation, visualizing the form of the solar golden falcon with fire emanating from his wings taking reign over the South. ΙΩ ΛΕΡΘΕΞΑΝΑΞ, you who are Helios who surmount now onto the highest heights of the realm of ΑΚΡΑΜΜΑΧΑΜΑΡΕΙ, take your place in the South as you come from the East, sending upon us radiant fire and life-giving heat! For I am ΜΑΛΠΑΡΤΑΛΧΩ standing before you, calling upon you who are ΛΕΡΘΕΞΑΝΑΞ! At sunset, hail the setting Sun in the West crossing the boundary from the Heights to the Depths. Face the setting Sun at the West, with the right foot forward and right hand raised in salutation, visualizing the form of the snake-tailed crocodile sinking below the oceanic waters taking reign over the West. ΙΩ ΑΒΛΑΝΑΘΑΝΑΛΒΑ, you who are Helios who sink now from the realm of ΑΚΡΑΜΜΑΧΑΜΑΡΕΙ into the realm of ΔΑΜΝΑΜΕΝΕΥΣ, take your place in the West as you come from the South, shedding cold water as you cleanse hot day with cool night! For I am ΜΑΛΠΑΡΤΑΛΧΩ standing before you, calling upon you who are ΑΒΛΑΝΑΘΑΝΑΛΒΑ! At midnight, hail the reborn Sun in the North at the nadir of the Depths. Face the midnight Sun at the North, with the right foot forward and right hand raised in salutation, visualizing the form of the sacred naked child enthroned on a blossoming lotus in the mud taking reign over the North. ΙΩ ΣΕΣΕΓΓΕΝΒΑΡΦΑΡΑΓΓΗΣ, you who are Helios who set now upon the darkest depths of the realm of ΔΑΜΝΑΜΕΝΕΥΣ, take your place in the North as you move from the West, reborn as king from the virgin womb of the world! For I am ΜΑΛΠΑΡΤΑΛΧΩ standing before you, calling upon you who are ΣΕΣΕΓΓΕΝΒΑΡΦΑΡΑΓΓΗΣ! Looking back at this ritual, we can begin to see something resembling a solar-elemental attribution to the four directions: east has a crown of clouds to clear the airs, so Air; south has heat and light, so Fire; west has coldness and water, so Water; north has the lotus in the mud, so Earth. This…well, huh. This is the same as the Enochian/Neopagan/Golden Dawn system of directional-elemental attributions. I’ll be damned; I didn’t expect to see this kind of thing pop up here, of all places, but it’s cool to see that maybe, just maybe, if we were to extrapolate this ritual out a bit into the powers of the four elements, it could tie itself into more modern forms of Hermetic or angelic magic. Anyway, this new approach I’m planning incorporates the four cardinal directions as the Sun travels between the two realms, without recognizing the guardians ΑΚΡΑΜΜΑΧΑΜΑΡΕΙ and ΔΑΜΝΑΜΕΝΕΥΣ in the same way as the other four guardians, while also asserting the power of the self through the presence of ΜΑΛΠΑΡΤΑΛΧΩ. I’m planning on taking this approach in the future as opposed to the mini-invocation before rituals as well as when calling on the guardians themselves for their own sake or for a more concerted purpose than just having their presence upon me. Like, I could supplement the self-proclamation at the end of the salutation with a libation or offering to the Sun, as well as any personal requests. It’s a possibility I’d like to explore, at least to learn more about these four spirits. For instance, I was in the habit of calling all the guardians at once on the night of the full Moon to make offerings to them, when either ΑΒΛΑΝΑΘΑΝΑΛΒΑ (if between sunset and midnight) or ΣΕΣΕΓΓΕΝΒΑΡΦΑΡΑΓΓΗΣ (if between midnight and sunrise) would dominate the conversation, with the guardians of the Heights and of the Depths kinda just hanging back and the other three guardians of the cardinal directions just kinda…being mute. Instead of doing that, I could dedicate the time to making four separate invocations, calling on each guardian of the direction separately as the Sun reaches its proper station, recognizing the guardian into whose realm the Sun was reaching or traveling to or from, and meditating or communing with the Sun through its proper face at the given quarter of the day-night cycle. Such a ritual invoking the four faces of the Sun at the four stations of the day-night cycle could be done, really, any day, but I’d think that it’d be best done at a time when the Moon is full or close to it, so that the Moon could represent the magus as the one who receives the light of the Sun and who is “standing before” the Sun. For a similar reason, the full Moon is the time when the most possible light is shed upon the Earth, both from the Sun on one side and the full reflection of the Sun’s light upon and from the Moon on the other. It’s a highly luminous time, and one when the most possible benefit could be obtained from the Sun. Alternatively, a day when the Sun is otherwise powerful, such as on that of an election, the summer solstice, or when the Sun reaches his exaltation point at 18° Aries, would be especially nice. ΙΩ ΕΡΒΗΘ, take your place in the East between dark ΔΑΜΝΑΜΕΝΕΥΣ and bright ΑΚΡΑΜΜΑΧΑΜΑΡΕΙ! ΙΩ ΛΕΡΘΕΞΑΝΑΞ, take your place in the South at the zenith of ΑΚΡΑΜΜΑΧΑΜΑΡΕΙ! ΙΩ ΑΒΛΑΝΑΘΑΝΑΛΒΑ, take your place in the West between hot ΑΚΡΑΜΜΑΧΑΜΑΡΕΙ and cool ΔΑΜΝΑΜΕΝΕΥΣ! ΙΩ ΣΕΣΕΓΓΕΝΒΑΡΦΑΡΑΓΓΗΣ, take your place in the North at the nadir of ΔΑΜΝΑΜΕΝΕΥΣ! And, of course, I write all the above from my comfortable position in the northern hemisphere, where the Sun rises into the southern skies and sets into the northern skies. For my readers in the southern hemisphere, where the case is reversed, you might try reversing the attributions of the names and directions as necessary, so that you’d have ΛΕΡΘΕΞΑΝΑΞ (noon) in the north and ΣΕΣΕΓΓΕΝΒΑΡΦΑΡΑΓΓΗΣ (midnight) in the south, moving counterclockwise instead of clockwise, and so forth. A while back I wrote about some different elemental correspondences for the four directions. Long story short, there are different systems of corresponding the elements to the four directions, with two primary methods: Agrippa’s method (Fire/East, Earth/South, Air/West, Water/North) and the Golden Dawn method (Air/East, Fire/South, Water/West, Earth/North). However, in a recent post Aaron Leitch discusses some of the biblical origins of the Golden Dawn system while exploring other methods of correspondence, and in a reply post Alex Sumner discusses why the Golden Dawn correspondences are the way they are. It’s all pretty interesting to read, so I suggest you do so. What he says makes sense, and points to something I’ve brought up in the past: if you’re working within a set tradition, don’t change stuff to suit your needs. If a text, grimoire, ritual, or teacher says to use a particular method, don’t change what they say to do until you’ve tried it first and, even then, only if you have an actual need to once you understand why it is the way it is. For the Golden Dawn system of magic, the physical location of the Temple (and thus the place where the elemental correspondences come into play the most) doesn’t matter, but the astral/spiritual location of the work, which takes place Elsewhere. That said, if you’re not working in that kind of framework, it may be better to experiment and change things before trying them out. It honestly depends. For instance, for an upcoming project (if ever I stop putting if off) where I plan to work with Wraeththu magic and mythos, the standard Golden Dawn/neopagan system of elements is used, but the system is also very personalized and dependent upon personal exploration. In that case, changing the directions of the elements may not be such a bad thing, and may help in my case to tie it into my other overall magic work. So, with all that in mind and with a slew of elemental correspondences to pick from, which one should you use? As in all else with magic, it depends. If you’re working in any kind of tradition that has already set its own rules (traditional Wicca, Golden Dawn, etc. ), use the correspondences already set down in stone. This way, you’re tapping into the current of that tradition, which links you to the overall power and history of that tradition, giving your rituals a stronger boost based on the power already built in that. Unless you want to experiment within the bounds of that tradition, you’re breaking away from it, which deprives you of the force already built up into it. If you’re working in a tradition that is place-independent and takes place in another dimension, much like the Golden Dawn where the physical location of the Temple is meaningless since the work in the Temple takes place in the Hall of the Duat in the Egyptian otherworld, then use the correspondences of that astral/otherworldly place. Since the correspondences of that otherworldly place take precedence, using a physical set of correspondences is meaningless. If you’re working in a solitary earth-based or nature-primary tradition, you might be best off using the elemental correspondences that best reflect the place where you’re currently working. This helps plug you into the natural flow of the powers that be where you currently are, and helps sync you to the place where you are, respecting the land and nature you’re actually working with. The standard Golden Dawn system is fine for Wicca in its original land of Great Britain, but other systems may work better should one works on the east coast of the US (e.g. Water/East, Fire/South, Earth/West, Air/North) or in the Southern Hemisphere (e.g. Air/East, Earth/South, Water/West, Fire/North). If you’re working in a tradition that is celestially-based or star-primary, I’d suggest using Agrippa’s correspondences that use the elemental associations of the zodiac signs. This implies that the elements come from the planets, which is pretty standard Hermetic doctrine, and helps link your work down here in this worldly sphere with the rest of the spheres of the cosmos, tying your elemental work into that of the planets directly. For myself, I use that last method, since as a Hermetic magician, my primary work is with the planets and the stars, which form the basis for the elements down here on Earth. By working with the powers of the cosmos, I can influence how these powers manifest down here, and by using the correspondence of the elements to the directions based on the zodiac, this gives me the easiest opportunity to make the transition from Up There to Down Here as smooth as possible. However, even this might change depending on the situation; if I were doing something specifically with the spirits of the elements and the land down here limited strictly and solely to down here, I’d find out how the elements locationally and temporally work around me and use the natural power of the place of the working, buffed out with my own celestial correspondences. Then again, if I were to tap into a more Golden Dawn type of current or if I were involved in setting up a Golden Dawn ritual by the book, I would use the Golden Dawn method because that’s what works for that specific ritual. In a way, rules in magic are helpful, but only up to a point, and only up to their own usefulness. Sticking to one rule at the permanent exclusion of all else can very easily deprive you of working methods or ideas to help buff out your work. As anyone familiar with Saturnine work knows, walls can bind and block, but walls can also be knocked down and rebuilt. Tradition, focus, scope, and need should all be taken into consideration when setting up a ritual or cosmological framework, and the combination of all of them may not be constant depending on the situation. After all this time, I’m finally getting around to reading Michael Cecchetelli’s excellent text the Book of Abrasax, however slowly that might be. I’m still just getting into the material, but it’s already off to a good start, especially since he starts off with a ritual I already use frequently: the Calling of the Sevenths, also called the heptagram or heptasphere rite. I use this daily in my morning ritual schema, as well as whenever I need a quick rebalancing and recharging. What’s interesting is that Cecchetelli adds in a bit after the intonation of the vowels by calling on four barbarous words of power in a manner reminiscent of the LBRP. It’s interesting, and I like the effect. It also reminded me of Stephen Flowers’ Hermetic Magic, where he also introduces the heptagram ritual along with a calling of the quarters, but using different words of power and introducing divine images or godforms to associate with the words. It’s interesting stuff, and I don’t know why I wasn’t using this before. (Flowers also used these same words to form the working circle of the magus, as shown on the book’s cover). Flowers’ work is based on the Greek Magical Papyri (specifically here II.104ff, XII.87ff), which forms the basis for the associations of the names and images with the cardinal directions. Cecchetelli uses a different set of names for the cardinal directions but doesn’t include the images, and I don’t know off the top of my head where he got his associations of the names with the directions from. Neither text offers associations of names with the depths, the heights, or the center, even though both authors incorporate the names into the heptagram/heptasphere ritual which make use of these three directions. In my own experiments, I combined these two sets of names by using Flowers’ attribution of the names to the cardinal directions and used the two other names from Cecchetelli’s list for the vertical dimension (with the spelling corrected to conform with the most commonly seen forms of the words). East: ΕΡΒΗΘ (ERBĒTH). A winged dragon with a crown of clouds rising above the horizon. North: ΣΕΣΕΓΓΕΝΒΑΡΦΑΡΑΓΓΗΣ (SESENGENBARPHARANGĒS). An infant child sitting atop a blossoming lotus. West: ΑΒΛΑΝΑΘΑΝΑΛΒΑ (ABLANATHANALBA). A crocodile with the tail of a snake arising from the waters. South: ΛΕΡΘΕΞΑΝΑΞ (LERTHEXANAX). A falcon with its wings stretching out to their full wingspan. Down: ΔΑΜΝΑΜΕΝΕΥΣ (DAMNAMENEUS). A young maiden looking forward with a torch in her left hand and a spear in her right. Up: ΑΚΡΑΜΜΑΧΑΜΑΡΕΙ (AKRAMMAKHAMAREI). An old man looking downward with a ring of keys in his right hand and a staff in his left. Although the divine images for the cardinal directions came from the PGM via Flowers, no images were given for ΔΑΜΝΑΜΕΝΕΥΣ or ΑΚΡΑΜΜΑΧΑΜΑΡΕΙ; these I came up with based on what was revealed to be after asking the names and the spiritual entities associated with them. They seem to work well for me, though admittedly aren’t traditional and are influenced by their planetary associations. I prefer Flowers’ attributions of the names to the directions over Cecchetelli’s mostly because I can find more extant texts with the same or similar words and directions. Though there are six names given above, there are seven points of the heptagram ritual; the point missing from the above list is the center point. I reserve this point for my own HGA, using his name as a word of power in its own right and focusing on his appearance as he appears to me. You might do the same, or reserve it for your patron/matron deity, other agathodaimonic entity, or your own divine Self using your craft name (a la the Headless Rite‘s “I am thy prophet Moses/Ankh-Af-Na-Khonsu…”). ΕΡΒΗΘ, take thy place before me! ΑΒΛΑΝΑΘΑΝΑΛΒΑ, take thy place behind me! ΛΕΡΘΕΞΑΝΑΞ, take thy place at my right! ΣΕΣΕΓΓΕΝΒΑΡΦΑΡΑΓΓΗΣ, take thy place at my left! ΑΚΡΑΜΜΑΧΑΜΑΡΕΙ, take thy place in the heights! ΔΑΜΝΑΜΕΝΕΥΣ, take thy place in the depths! (name of HGA), take thy place with me, now and at all times, here and in all places! Of course, I wanted to do a bit of research in what these names mean, if they mean anything at all. In a lot of cases when it comes to these barbarous words of power, there is no etymology to be found, though interesting conjectures might be made or results found through gematria and isopsephy. ΕΡΒΗΘ is part of a frequently-seen Setian formula in the PGM, usually in damaging or harmful contexts; ΑΒΛΑΝΑΘΑΝΑΛΒΑ and ΣΕΣΕΓΓΕΝΒΑΡΦΑΡΑΓΓΗΣ are very common words used all throughout the PGM though with no known origin besides a possible Hebrew or Aramaic etymology, but often used for beneficial purposes. ΛΕΡΘΕΞΑΝΑΞ is part of a much longer word known as the Aberamen formula, itself a palindrome which contains the name of Thoth. ΔΑΜΝΑΜΕΝΕΥΣ is known to be one of the six Ephesia Grammata, hypothesized to refer to the Sun since ancient times, but has also been seen in the PGM for love and luck. ΑΚΡΑΜΜΑΧΑΜΑΡΕΙ is a word I’ve come to know as a Semitic phrase translated to “cast off the nets”, as in any boundaries or bindings that would prevent a ritual from working. Beyond this, unfortunately, my research skills don’t turn up much. As for the images, those are a bit easier, given that we know already to look at Greco-Egyptian symbolism. Serpents are often seen as forces of great power, especially that of vital or creative essence; being both of the earth (crawling) and of the sky (flying), the flying serpent is not unlike the image of the Aztec god Quetzalcoatl, with whom ΕΡΒΗΘ shares some similarities. Falcons are solar symbols, and is known to be the countenance of the Egyptian god Horus or Ra, depending on the timeframe. Crocodiles are seen as gateways to the underworld and an animal of Set, countering the lighter images of the winged serpent and falcon. The lotus is, much as in Eastern symbolism, an image of purity and eternity, and combined with the image of the infant symbolizes divinity being born into the world (the North is the Egyptian direction of holiness and immortality). The images of the keyring and staff as well as of the torch and spear are a little more modern, to me, since they were things I “tuned into”, and so don’t have clear Egyptian correspondences. The keyring and staff suggest the power over freedom (unlocking and locking as well as barring from and supporting one), while the torch and spear suggest active force (illumination, flammability, battle, direction). Regardless of their occult meaning, the words work, which is the important thing. For those who already do or have experience with the LBRP or calling the quarters/Watchtowers, you already know more or less what to expect with this. When I use the calls of the names after the heptagram rite, I end up feeling distinct presences at the directions, kinda like guardians or gatekeepers, neither wrathful nor peaceful. I like it, and it makes me feel safer and more powerful all at once. It’s probably something I should’ve been doing in some form by this point, but I’ll also probably tweak and change it as needed until I come up with something a little more stable and fixed. Using all six names isn’t strictly necessary; the four cardinal directions alone will suffice, using either Flowers’ or Cecchetelli’s associations of the names to the directions, but I prefer to use all six. Using that extra third dimension helps me establish a magical zone or operant field, much as using the Qabbalistic Cross, “parting of the veil”, L(B/I)R(P/H), or what-have-you. Four elements and archangels, four directions. GO. The logic for this can be understood by looking at a horoscope. Let’s say that, at the start of the astrological year, the Sun rises at dawn on the spring equinox (0 Aries). Aries, then, is ascending on the east; Libra descends on the west; Capricorn is at the midheaven; Cancer is at the nadir. Aries is ruled by Fire, Libra Air, Capricorn Earth, and Cancer Water. In this system, the hot elements (Fire and Air) are on the East-West axis, while the cold elements (Water and Earth) are on the North-South axis. This makes sense to me, at least, though I haven’t seen this put forth as an official explanation of this. Something more official might go something like this: the order of the elements in the Zodiac is fire, earth, air, and water (Aries, Taurus, Gemini, Cancer…); the order of the elements, going around clockwise starting at East, is fire, earth, air, and water; the order of the four cherubim presented in Rev 4:7 is “lion, calf, man and eagle”, representing, respectively, fire, earth, air, and water. Lots of stuff to chew on here, and definitely reverberates well. These attributions seem to have originated with the Golden Dawn who were trying to expand on Dee’s work, and the four angels and angels from Dee were assigned their elements. Later on, Gerald Gardner used Golden Dawn material in forming Wicca, which has propagated this system to many forms of neopagan cosmologies that exist today. The Golden Dawn likely used a solar-based or geographic system to determine these elemental attributions. At least from the northern hemisphere, when the Sun is at its highest point and hottest, it’s in the southern part of the sky (hot and dry, Fire). At dawn and dusk, things are heating up and evaporating the dew (hot and moist, Air) or cooling down with sweat and rain (cold and moist, Water). At nighttime, things are dark, cold, and hidden, all qualities associated with Earth (cold and dry). Alternatively, from their primarily European frame of reference, they considered the southern lands to be hot and dry like the Sahara (Fire), and northern lands like Scotland or Scandinavia to be barren and frozen (Earth). The Atlantic ocean was to the west (Water), while fertile lands and places of learning and civilization were out to the east (Air). This system breaks down when applied to other parts of the world, especially the entire southern hemisphere, which might be better off switching Fire and Earth. Indeed, this is one of the major issues with this system, and I’ve seen it applied, changed, or tweaked in various ways. The angels ruling the elements are the same between the two systems, as are most of the other correspondences between the elements and other beings and attributions. The Golden Dawn style of attribution is common, both in modern ceremonial and neopagan systems of magic, but I prefer the traditional Agrippan attributions and use that in my own work. Since the attributions between elements and other things are largely the same regardless of the system, with just the directions and minor details switched around, I normally fit things into the Agrippa system whenever I adapt a ritual or tool into my own practice. It’s a more classical or Renaissance system that I prefer, following in the steps of past and present traditional Hermetic magicians, and would seem to be independent of hemisphere, but YMMV. For instance, my Circle of Art has four four-lettered names of God around the outer ring: Agla in the East, Eloah in the North, Eheieh in the West, and Adonai in the South. I got these godnames from Fr. Osiris’ New Banishing Ritual of the Pentagram, which I find of much better than the standard LBRP; however, he follows the GD correspondences and uses Agla in the South, Eloah in the West, Eheieh in the East, and Adonai in the North. Given the system I work within, I find that East=Fire/Michael/Agla works better than East=Air/Raphael/Eheieh. Likewise, when I decide to do a personal Litany to the Holy Angels, I swap the order of the angels, calling on Michael, Auriel, Raphael, and Gabriel in turn instead of Raphael, Michael, Gabriel, and Auriel. Correspondences differ between traditions. That’s alright. Different traditions operate on different views of the same cosmos, different interpretations of the same reality. Within one system, complete and well-structured according to its own rules, things work well; swapping between systems without taking into account different correspondences may cause things to slighty out of tune or entirely out of order. Almost every magician likes circles. It’s not really our fault; they’ve been used since before written records of magic for protection, isolation, containment, or just simply marking a boundary of working space in a magic ritual. They’re important, of course, but sometimes magicians can go overboard with them (see the Clavicula Solomonis, Trithemius rite, Munich Manual, or the Heptameron). It’s even gotten to the point where there are whole networks of artists in the video game, anime, DeviantArt or other communities who specialize in elaborate and intricately detailed magic circles. They are pretty cool-looking, admittedly, but we have to keep in mind that the circle is still a tool used for protection and containment of a consecrated space. For all the hype, magic circles don’t need to be that complex. A simple ring around yourself, drawn in the dirt or carpet or sprinkled around with salt, will suffice for most intents and purposes. PGM or classical styles of Hermetic magic may use a few voces magicae (Ablanathanalba, Sesengenbarpharanges, Lerthexanax, etc.) and maybe a cross in the center. Wiccans might use a ring of candles, pinecones, or rope. Goetic magicians, especially those of the Lemegeton persuasion, might go full-out with the complete Solomonic circle. The effect could be stronger to include all those geometric designs and names of God, but the effect is the same at its core. Such a complex circle, though, might be preferred for permanent working spaces or for carpets/rugs/platforms that can be transported from place to place. Well, I want a circle of my own. I don’t have the space for a full 9′ Solomonic circle, and I keep getting images from dreams or my astral temple of something simpler, anyway. After some doodling, thinking, and research, and struggling to keep this a clean design, I’ve come up with the following Circle of Art. The construction of the circle is as follows: make two circles, one in the other. In the ring between the circles, write the godnames Agla towards the east, Adonai towards the south, Eheieh towards the west, and Eloah towards the north. These names of God represent the four elements in their quarters according to Agrippa, and I got them from Frater Osiris’ New Banishing Ritual of the Pentagram, a revised version of the Lesser Banishing Ritual of the Pentagram that updates or cleans up some of the possible inconsistencies in its format (though I kept the older Agrippa-style elemental and directional attributions that I use for my altar and other work). Agla (אגלא), a contraction of Ateh Gibor Le-Olam Amen, is associated with Fire through the word Gibor, part of the godname of Mars and Geburah, Elohim Gibor. Adonai (אדני) is associated with the Earth through the godname of Malkuth, Adonai ha-Aretz. Eheieh (אהיה) is associated with Air since it is entirely breathed out without any hard or soft consonants, and also since it is associated with pure spirit through connection with the sephirah Kether. Eloah (אלוה) is associated with Water by its first two letters El (אל) which is the godname of Jupiter and Chesed which, although airy, is made passive by its last two letters of the word which it shares with the passive letters of the Tetragrammaton. In this scheme, all the names of God on the outer circle have four letters and begin with the letter aleph (א), showing a harmony between them that links all the elements and directions together in a kind of spacial and spiritual unity. It helps to omit the use of the Tetragrammaton here, especially since use of the Tetragrammaton should (but hardly ever is) be used sparingly (never, as my orthodox Jewish brother would say), and since the Tetragrammaton already comprises all four elements. Plus, these godnames link up to the four sephiroth used in the Qabbalistic Cross, lending both an elemental/microcosmic and planetary/macrocosmic power to this part of the circle design. Major major props to Fr. Osiris for being so ingenious with this. On the inside of the circle, there’s a diamond for the magician to stand, with a cross inside with a letter of the Tetragrammaton on each end of the cross. The corners of the diamond, the cross, and letters of the Tetragrammaton are aligned towards their proper directions and elements (yod for east and Fire, one Heh for south and Earth, the vav for west and Air, and the other Heh for north and Water). The inner ring can be considered the boundaries of the celestial world, and the diamond the boundaries of the terrestrial world. Outside the diamond and aligned with each of the four directions are four hexagrams, which are known to have a protective or banishing quality against harmful energies. 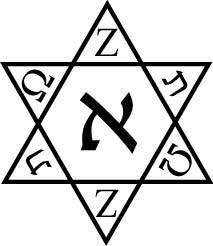 However, unlike the Solomonic style of hexagrams that have the letters of the word ADONAI written around it and the Greek Tau cross in the middle, I came up with my own design, a figure I call the Star of Azoth. In this way, you have the beginning of everything and the end of all things combined into a single unit Azoth (אZΩת). It’s got a similar meaning, in this way, to the phrase “[EGO] ALPHA ET OMEGA”, but that phrase really bothers me. I mean, the names of Greek letters spelled out in Latin? Really? How gauche. Besides, I’ve used the same word on my fancy magical cane before, and I rather like this construction over the Alpha et Omega construction. Saturn, Mars, and Mercury share one progression of letters, starting at the top Z and going counterclockwise. These planets are all on the Pillar of Severity on the Qabbalah, and all show cold, logical, or harsh qualities. The Moon, Venus, and Jupiter share the other progression, starting counterclockwise from the bottom Z. Jupiter and Venus are both on the Pillar of Mercy, though the Moon is on the Pillar of Balance. However, these planets all share generative, kind, and generous qualities. Saturn, Mercury, and Venus share the upwards-pointing triangle, indicating the ascent to the Almighty through the cosmic boundaries (Saturn) through the use of magic and spirituality (Mercury and Venus). Mars, Jupiter, and the Moon share the downwards-pointing triangle, indicating the descent of spirit into the physical world, with Jupiter and Mars determining the quality and quantity of spirit allowed and the Moon giving birth into the physical world as the lowest part of the heavens. Moon and Saturn share the letter Z, which reveals their natures showing boundaries (Saturn as the boundary between the celestial and the divine, the Moon as the boundary between the celestial and the terrestrial) as well as their feminine and generative nature (Saturn being associated with Binah, the black Mother and God as Female, and the Moon representing the fertility of mother goddesses and generation through the feminine cycles). Mars and Venus share the letter Ω, and these too are associated with being the masculine and feminine poles of energies and forces. They both represent kinds of nonlogical drives, that of force and action by Mars and that of emotion and reaction by Venus. Jupiter and Mercury share the letter ת, and it’s been shown through Qabbalistic texts that Mercury and Jupiter, or Hod and Chesed, share a connection of their glory, which both sephirah names can translate to. Both are related to education and nobility, for one, and both rely on each other as a forest on its trees and trees on its forest. As the smallest and largest planets in the solar system, these share a kind of size extremity on opposite ends. In the center of the hexagram, we have the Sun associated with aleph. Aleph and alpha, in terms of gematria, both have the numerical value of unity, representing the Almighty, which has its representative in the solar system as the Sun. In addition, in terms of the Qabbalah, the sephirah Tiphareth is known as the Lesser Countenance of God, revealed to the world as the Son by whom all things can be done. You can’t exactly do much without eating a good meal, grown by the light of the sun, now, can you? 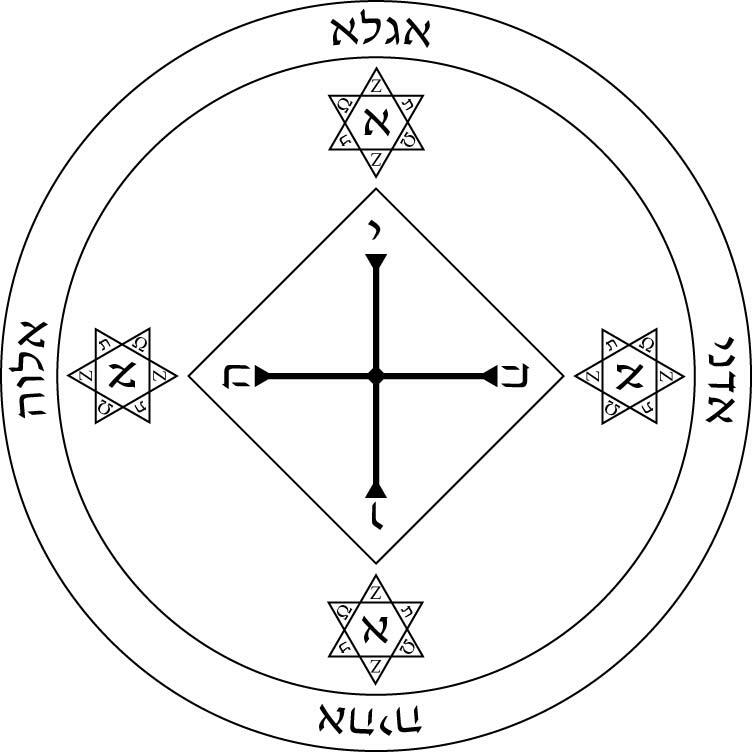 Putting it all together, we come up with this magic circle which combines representations of the elements (through the Tetragrammaton and the four four-letter names of God on the outer ring) and the planets (through the use of the hexagram figure and the Star of Azoth in the inner ring). With the magician standing in the center of it all, we complete the circle in a third dimension and add one final part to the whole setup, the operative force or the quintessence that binds the entire cosmos together, the magician himself. This looks promising as a circle design, and I hope soon enough to get a big enough piece of canvas to roll out, paint on, and use in my own work.